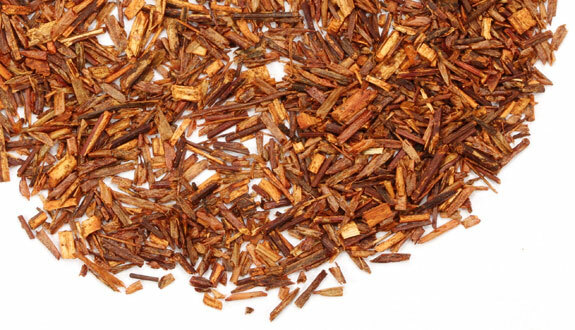 Rooibos tea from South Africa infused with the delicate scent of the night-blooming jasmine flowers. If you enjoy jasmine tea, we urge you to try the sublime taste of its well-made varieties. This unique flavor produces a sweet, caffeine-free cup with a light and lingering scent of fresh jasmine flowers. With some teas, they grow on me and I find that as I continue to drink the tea, I like it better and better. With this tea, it’s – sadly – quite the opposite. I liked it the first time I tried it, but now after having had a couple of cups of this tea, I am finding that I like it less. I had high hopes for it. I ~LOVE~ jasmine, and was really hoping that this would be awesome, and I’m a bit disappointed that it isn’t all I had hoped it would be. Somehow, the sweet yet sharp jasmine flavor does not meld well with that funky saccharine-y sweet taste of the rooibos. I can taste the woody notes of the rooibos, which is at times pleasant (depending upon the blend), but, here, it just doesn’t work for me. I really wish it did – but it just doesn’t. Don’t get me wrong, it isn’t a bad tea, but, I just don’t hold it in as high regard as I wanted to. It doesn’t do jasmine justice, and I think that is a shame. I would really love to hear from our readers that have tried this tisane and enjoyed it. I would love to hear other perspectives on this interesting yet disappointing blend.